Author Lynn Lorenz is my guest today on Muse Wednesday. She is sharing what inspired her to write m/m romance. In the first book I ever wrote, before I knew about gay romance, The Avalon Patrol: The Road to Avea, I had two strong male characters – Stephan Bane and Rolf Creel. And I had two female characters, Sarah Tallow and her best friend Lucy. The men and women were supposed to get together, but every time Stephan and Rolf got together, sparks flew. The door to Rolf’s office flew open and slammed into the wall. He jumped in his chair, his hand flying to his wand. “Where the hell were you?” Stefan stood in his door, fists clenched. “Stefan, what are you talking about?” Rolf laid down his pen, opened the drawer, and slipped the paper he was working on inside. “I’m talking about being at Chester, damn it. I called for you and your men. You didn’t answer.” Stefan stepped into the small office and towered over the desk, filling the room with his power. A prickle of warning danced across Rolf’s skin. He pushed back in his chair as the fine blond hair on his arms stood on end. “My men were ready. I waited for your call, but it never came, so I dismissed them.” Rolf gathered his own power, but kept it in check. It wouldn’t be the first time they’d tested each other with power or fists. “Of course I called.” Stefan’s oddly colored eyes widened. “Did you use the mirror?” Rolf reached into his pocket and pulled out his service mirror. Opening it, he saw only his own reflection. He held it close to his face, his blue eyes inspecting its polished surface. “Damn right you will!” Stefan didn’t bother to look for himself, but tossed it on the desk. Stefan remained silent, but dropped into a chair against the wall. “How bad was it?” Rolf sat back. His guts twisted as he listened to Stefan give a brief description of the encounter with Blackmoor’s men. To me, it was natural for them to get in each other’s face, but back then, I had no idea I could let them do more than that, let them push each other so far they’d have to fight for dominance of their first kiss. Truthfully, I’ve always struggled with my heroines, but I had no idea that inside me, those men were longing to get to each other. I just followed the rules of straight, traditional romance, the only romance I’d been exposed to. Then I bought a book for my husband. 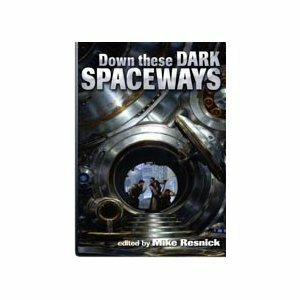 Down These Dark Spaceways. It was an anthology of novellas written by some of the greats of science fiction, in the “noir” style. Sam Spade in space sort of thing. I love a good mystery, so when he didn’t pick up the book, I did. And lo and behold, buried several stories in, was a novella by David Gerrold called In The Quake Zone. As I read it, I think I blew a gasket. He wrote a story about a detective who fell for a young man he was supposed to save, as he struggled with his own sexuality and his desire for this openly gay young man. It was the first story I’d ever read that involved gay men. Now it didn’t have anything more than a kiss or two on the cheek, and the stirrings of desire, but it slammed into me at warp speed and left me breathless. At the moment I finished the book, I had my “eureka” moment – I had been writing about men desiring men all along, I just never knew it was possible. Once I realized it, I searched other stories out. Dayum! There were a bunch of them. I could do this. I could leave the ladies out and write about the men. Men in lust. Men in the heat of passion and desire. Men who love men and find their happily ever after. I went to RWA that year and pitched a story to Loose Id’s Treva Harte. That story was The Mercenary’s Tale, my first gay romance, set in medieval times. She loved it, asked for some changes, and I ran with her marvelous suggestions. It was the first story I ever sold and it opened the door to an exciting and heart satisfying career – sharing my stories of men in love. Even though I do occasionally write stories with heroes and heroines, my heart stays with my men and giving them their HEAs. Lynn Lorenz lives in Katy, Texas with her husband, two kids and a sweet, but neurotic dog. She’s been writing with her heart set on publication for three years. To her, it’s the heart that matters, and she believes that if you open your mind, the heart will follow. Visit her web site. ~ by Monette Michaels on October 31, 2012. I loved Soul Bonds. That was one of the first books I got when I jumped into the m/m romance world. I’ve also enjoyed the Rougaroux Social Club books. Thanks Tiffany! It means so much to have you say that! Jamie, I’m glad you’re enjoying the Bayou series! Stay tuned for Bayou Loup coming out Jan.1st! Thanks to Monette for letting me post here! You rock!